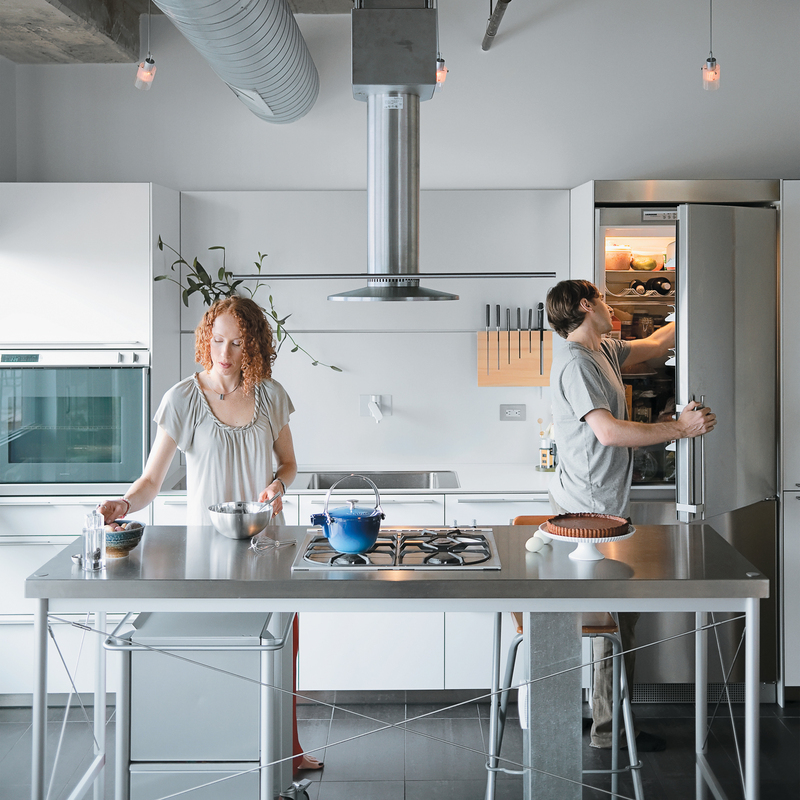 On the cover of our March 2010 Recipe for Success issue, Chelsea Jackson sits at the kitchen island while her husband, Arthur, plates their dinner. What steals the shot from the Chef's Table article, however, is Chelsea's s'mores tart, looking divinely delicious at the end of the island. Chelsea, a certified pastry chef, happily sent us the recipe for the tart--which is her own combination of three recipes, two adaptations of existing recipes and one of her own--after a reader wrote in asking for the instructions. Roll up your sleeves and dive in. Chelsea Jackson’s s’more tart stole the show on our March 2010 cover, so we asked for her secret recipe. To make the dough, combine the flour, brown sugar, baking soda, salt, and cornstarch in the bowl of a food processor fitted with the steel blade. Pulse or mix on low, just until incorporated. Add the butter and pulse on and off, on and off (or mix on low) until the mixture is the consistency of coarse, wet sand. In a small bowl, whisk together the honey, milk, and vanilla extract. Add to the flour mixture and pulse on and off a few times or mix on low until the dough barely comes together. It will be very soft and sticky. Lay out a large piece of plastic wrap and dust it lightly with flour, then turn the dough out onto it and pat it into a rectangle about 1-inch thick. Wrap it, then chill until firm, at least 2 hours or overnight. Divide the dough in half and return one half to the refrigerator. Roll the dough between two sheets of floured parchment paper (or use a heavily floured surface) into a circle about 1/8-inch thick. The dough will be sticky, add more flour as necessary. Chill the dough between the layers of paper for 15 minutes. Remove the paper and ease the dough into a 9-inch fluted, springform tart pan. Dock the dough on the bottom and sides with a fork. Chill for 15 minutes. Place a round, fitted sheet of parchment paper into the dough-lined pan and fill with baking beans. Bake the tart on the middle rack of an oven set at 350°F, removing the parchment lining and baking beans, and rotating, both halfway through baking. Total baking time will vary, but should take about 20-30 minutes. The crust should be firm to touch. Be careful not to over bake. Place shell on a cooling rack and cool completely in its pan. Combine the chocolates in a stainless steel bowl. In a heavy, small saucepan, heat the cream and salt just to boiling. Pour over the chocolate and begin whisking immediately, until smooth. Allow the chocolate mixture to cool for a few minutes, stirring occasionally. Quickly whisk in the pieces of butter, making sure the ganache mixture remains smooth and consistent and does not break (this step is easier when done with an immersion blender). 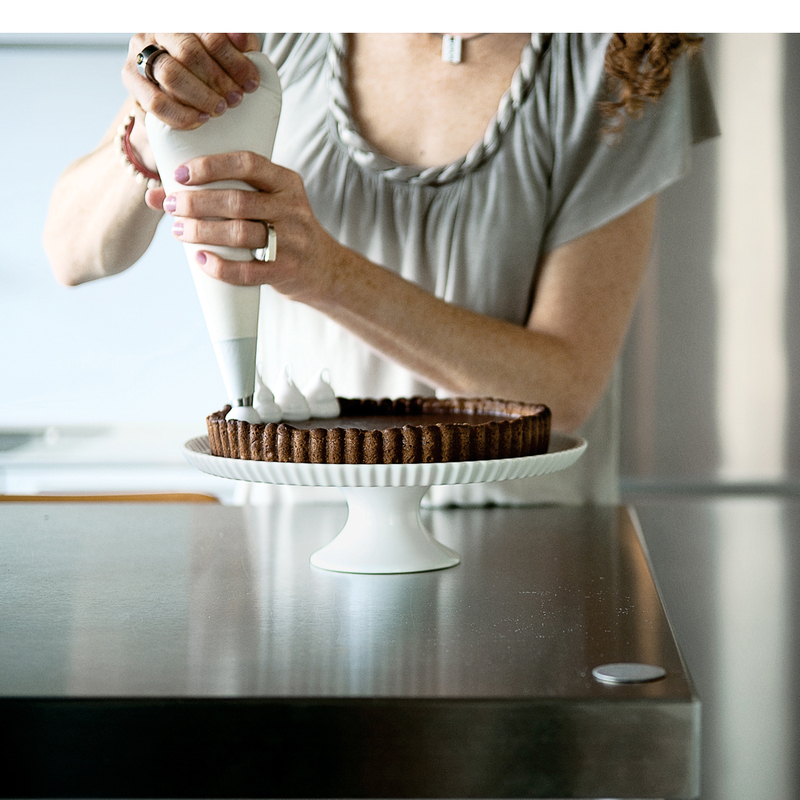 Pour into cooled graham cracker tart shell and cool in refrigerator thoroughly, until ganache is set. In a small bowl, bloom gelatin in 1/3 cup water for a few minutes. In a small but heavy saucepan, combine 1/4 cup water, sugar, corn syrup, and vanilla, and cook over medium heat (avoid the urge to stir the mixture) to 238°F. Place bloomed gelatin and hot syrup into the bowl of a mixer fitted with a whisk attachment. Whisk on high speed until marshmallow mixture holds stiff peaks and is shiny (this will take several minutes). If you have a Polyform Smoking Gun, smoke the marshmallow mixture for 2-3 minutes during the whisking process. Scoop the marshmallow mixture into a piping bag, and pipe your preferred shape of marshmallows in concentric circles on top of the ganache, covering ganache completely. (I use a 1/2-inch tip.) Brulee the marshmallow topping with a brulee torch. Serve immediately. Store in the refrigerator (bring to room temperature before serving).